The Florida Board of Education has named Chancellor Pam Stewart to serve as Interim Education Commissioner until a new one is found. The board also plans to hire a firm to search for a new education commissioner. “And we can make all suggestions of interest for candidates we’d like them to review to the search firm, they’d then go through the process talking to all of those people and then coming back with a list of candidates to interview." Board Chairwoman Kathleen Shanahan said she wants to get the search process started quickly. Several board members expressed support for Commissioner Gerard Robinson’s job performance in a year where changes to the state FCAT test resulted in drops in student scores and school grades. “He managed to handle all the obstacles and problems professionally and has brought us to a very good place in one short year. And I think we all feel the same way about him and will miss him," said board member Barbara Peterson. Robinson, a school choice advocate, has been criticized for the way he’s handled the transition but he says he wasn’t forced out of the job. His decision to step down has some public school advocates hoping it may signal a shift in state education policy. 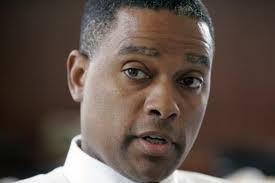 Update 6:18 pm: The State Board of Education will meet Thursday morning to figure out how to move forward in the wake of the Resignation of State Education Commissioner Gerard Robinson. The Board will meet via teleconference at 7 am. Gerard Robinson’s decision to step down at the end of August comes after a series of changes to the state FCAT test which led to a drop in scores, school grades and a public outcry. 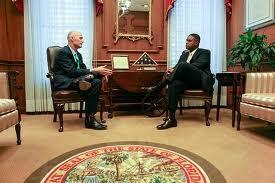 Florida Education Chief Gerard Robinson has become the latest agency head to resign. Robinson had been on the job for only a year. He’s been under fire for his handling of changes to the state’s FCAT test that resulted in lower grades for students and schools. But his decision to step aside at the end of August is also raising questions about the state’s leadership under Governor Rick Scott—and why more than 10 agency heads have left their jobs.